Wood covered with plates of shell held by gilded copper rivets and black and gold <i>hiramaki-e</i> (flat-sprinkled picture) lacquer. Gilt metal fittings. This coffer is an example of Japanese lacquer made for export to Europe, differing in decorative style and form from those made for the domestic market. It was not until after the Portuguese reached Japan in 1543 that organised trade of lacquerware with Europe began. Being quite unlike any material in the West, lacquer was greatly admired for its hardness, lustre and decorative potential. Japanese lacquer craftsmen evolved a style of decoration they considered appropriate for the unknown Westerners. This export laccquerwork was in a hybrid style that combined western forms with decoration derived from both foreign and Japanese traditions. The majority of these pieces were cabinets and domed coffers, such as this example. That these differed from indigenous Japanese furniture is apparent in the lack of appropriate terminology. This resulted in such made-up terms as kanabokogata ('boxes in fish-sausage shape') to describe a coffer. 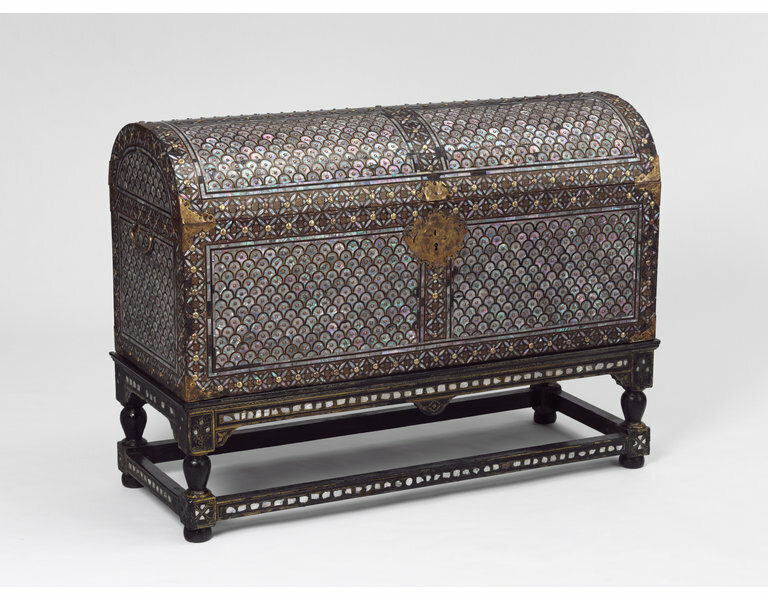 This coffer is a comparatively rare variant of typical nanban lacquerwork, consisting of meticulously-shaped shell pieces covering the entire exterior surface, with lacquer also in between and on the borders. Although Japanese lacquer has a long history of inlaid shell work, the extensive use of shell on nanban wares owes more to Chinese and Korean traditions; in particular the influence of Indo-Portuguese objects made in Gujarat, India, covered extensively in mother-of-pearl shell, is evident. 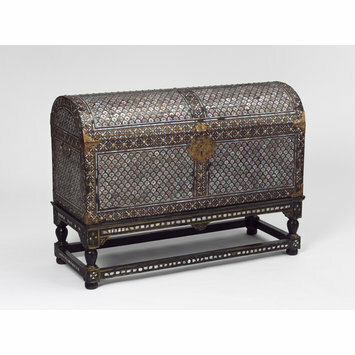 This coffer is of rectangular form with a hinged domed lid. Since it is entirely covered with lacquer and inlaid decoration of mother-of-pearl shell, it is impossible to give precise details as to its substrate and methods of manufacture. However, due to analysis undertaken during conservation work on other comparable export lacquer chests, it is possible to speculate as to its likely manufacture. The coffer is composed of a substrate of an unidentified wood. The joints overlap at the side, and at least some of the corners are reinforced with ferrous metal cramps. A crack in the lacquer suggests that, at the sides, the base is flush with the outside edges. The base consists of a plank or planks of wood for the front, back, bottom and sides. Due to crack lines in the lacquer, it would appear that the domed lid is composed of five planks of wood which have been made to conform with the curve of the lid. 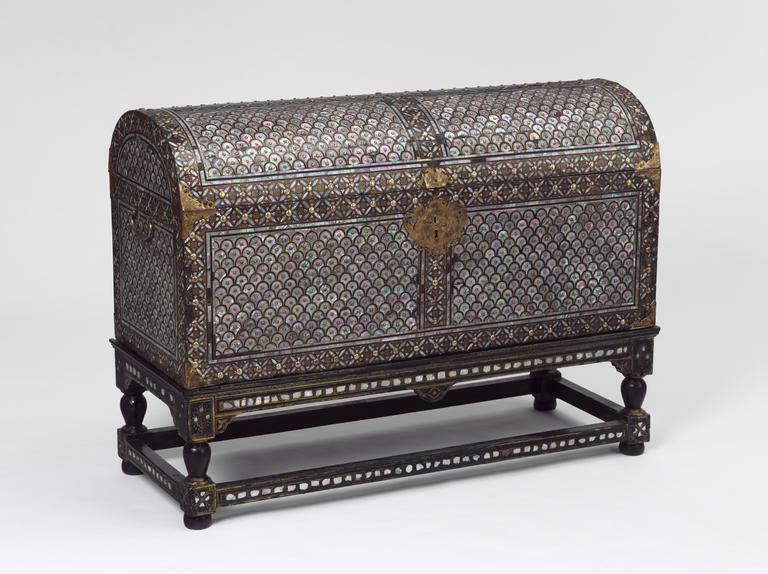 The coffer is covered almost entirely with around 1,500 shaped pieces of shell from a species of abalone or awabi, possibly Sulculus supertexta or Notohaliotis discus, each secured by a gilt-copper rivet. Each piece of shell is separated by a sequence of three narrow strips of gold, black and gold hiramki-e ('flat sprinkled-picture') lacquer. This is surrounded, on all sides, by a geometric border, in addition to one that runs from the bottom centre front to the bottom centre back. These result in the overall surface being divided into twelve decorative panels of different shape and size, two on the front, two on the back, four on the lid, one on each side of the base, and one on each side of the lid. Each panel is surrounded by a thin line of gold lacquer, a row of rectangular pieces of shell forming a continuous line, and black lacquer. This is followed by a wider, outer border consisting of a row of four-peatalled flowers in shell secured by a larger rivet, alternating with smaller gold lacquer floral motifs surrounded by four smaller pieces of shell. The interior of the lid is decorated with a pair of phoenixes in flight on a ground of tendril scrolls in gold hiramaki-e and e-nashiji ('picture pear-skin ground') lacquer and inlaid shell on a black lacquer ground. The remainder of the interior and base are covered with black lacquer. The coffer is fitted with gilt copper and ferrous metal handles, lock-plate, hinges, corner fittings and decorative back plates along the edges. The handles on both sides are attached with split pins and decorated with loose floral scrolls. The large lockplate on the front is engraved with debased European designs of two putti among fruit, flowers and birds on a crudely granulated ground. The twelve corner fittings bear similar fruit and flower designs. The coffer rests on a European stand consisting of a frame supported on four baluster legs joined by stretchers. It is decorated in imitation of the coffer in gold on black japanning (European imitation lacquer) on a black ground, inlaid with pieces of shell. Wood covered with plates of shell held by gilded copper rivets and black and gold hiramaki-e (flat-sprinkled picture) lacquer. Gilt metal fittings. The coffer was housed at Rushbrooke Hall, near Bury St. edmunds, between 1759 and 1919, and was described in the sale catalogue of Wednesday 10th December, 1919 (Knight, Frank and Rutley), lot 240, as a 'Stuart marriage coffer'. The vendor's mother sold Rushbrooke to Lord Rothschild and in 1948 gave the coffer to the vendor. Rushbrooke Hall was destroyed by fire in 1961 after a long period of neglect. Rushbrooke Hall was originally built around 1550 for Edmund Jermyn and was altered in the 18th century. The coffer was included in an inventory of 1759, when the house was still filled chiefly with the possessions of Henry Jermyn, Lord St. Albans (d.1684), a prominent courtier of Charles I and Charles II, and a favourite of Queen Henrietta Maria. The coffer is presumed to have formed part of his property, and to have been included in a (lost) inventory of 1674 which listed the items in his estate which were not to be liquidated at his death but given to his nephew and heir, Thomas Jermyn 'for the well furnishing of the house called Rushbrooke Hall and desire that they may goe along with the said house and not be removed from thence and that the said house may never bee thereof disfurnished' ( 6 December 1681, '33rd Charles II'). Coffer, domed shape, wood covered in black lacquer and almost completely covered on the exterior with applied plaques of shell, Japan for the export market, ca. 1680-1720. Europeans admired lacquer for its hardness and lustre, which had no equivalent in western materials. In response, Japanese craftsmen developed a style of lacquer especially for export that would not have appealed to Japanese customers. It featured the extensive use of shell inlay, and is similar to Chinese and Korean work, as well as to lacquer made in India for the Portuguese market. Lacquer was so rare and difficult to obtain that it had an extraordinary allure in the West. This coffer probably belonged to Lord St Albans, a favourite of Queen Henrietta Maria.